Implementing Oracle API Platform Cloud Service moves from theory to practice using the newest Oracle API management platform. This critical new platform for Oracle developers allows you to interface the complex array of services your clients expect in the modern world. First, you’ll learn about Oracle’s new platform and get an overview of it, then you’ll see a use case showing the functionality and use of this new platform for Oracle customers. Next, you’ll see the power of Apiary and begin designing your own APIs. From there, you’ll build and run microservices and set up the Oracle API gateways. Moving on, you’ll discover how to customize the developer portal and publish your own APIs. You’ll spend time looking at configuration management on the new platform, and implementing the Oauth 2.0 policy, as well as custom policies. The latest finance modules from Oracle will be examined, with some of the third party alternatives in sight as well. This broad-scoped book completes your journey with a clear examination of how to transition APIs from Oracle API Management 12c to the new Oracle API Platform, so that you can step into the future confidently. 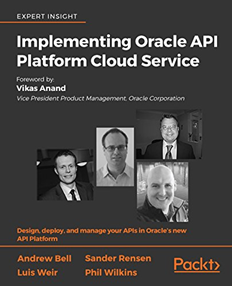 This book is for all Oracle developers who are working or plan to work with the Oracle API Platform Cloud Service. Get the book here. Additional Integration books are listed in our community wiki here.